You use the Variable View tab of the Data Editor window in IBM SPPS Statistics to define the names and characteristics of variables. 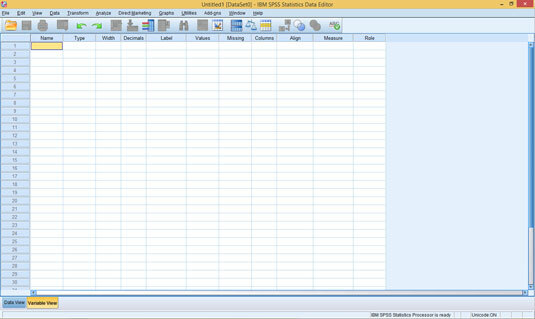 This is where you always start if you plan on entering data into SPSS. As you can see in the figure, every characteristic you can define about your variables is named at the top of the window. You use the Variable View tab to define the characteristics of variables. All you have to do is enter something in each column for each variable. The predefined set of 11 characteristics are the only ones needed to completely specify all the attributes of any variable. The characteristics are all known to the internal SPSS processing. When you add a new variable, you’ll find that reasonable defaults appear for most characteristics. The Variable View tab is just for defining the variables. The entry of the actual numbers comes later. Each variable characteristic has a default, so if you don’t specify a characteristic, SPSS fills one in for you. However, what it selects may not be what you want.